Nine years I’ve been waiting to see this sight. Nine goddamn years I’ve been waiting to see Tom Brady leaving the Meadowlands with his head down. Nine years I’ve been waiting to see Bill Belichick, who I will never, ever forget should’ve been the New York Jets coach before he wussied out and quit after one day, running off the field in shame. Yes, it’s been a long time since my beloved Green and White defeated the evil New England Patriots at home. Man what a great Sunday it was, as the Jets won, 16-9. A punishing, aggressive, harassing defense tortured the heck out of Giselle Bundchen’s husband, holding him to three measly field goals. Guys like Bart Scott and Darrelle Revis and David Harris and Lito Sheppard and Shaun Ellis (really, the whole Jets defense played great) got after Brady and the Pats’ receivers all day long. Did the Jets greatly benefit from Wes Welker not playing? Of course. Welker is awesome. But the Jets’ defense was superb in all areas. Revis, in particular, totally shut down Randy Moss, and unlike in some games in his past, it looked like Moss was trying. And the offense? It was good enough. 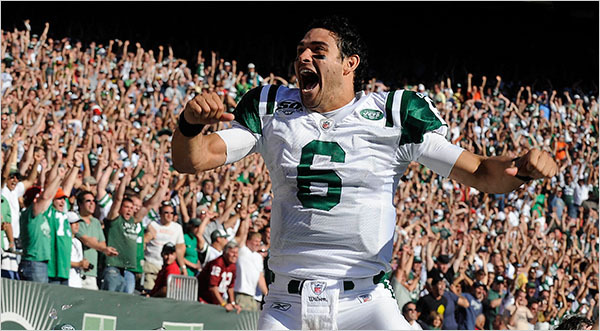 I was a little worried about Mark Sanchez in the first half, but the kid turned it up. You don’t understand how nice it is for a Jets fan to see a quarterback zip the ball into receivers; after the last seven post-Vinny Testaverde years, we just haven’t seen that. I was, of course convinced that after Jets coach Rex Ryan stupidly tried to throw the ball on 3rd and 3 with 2:30 left in the game and the Jets holding a 16-9 lead (come on Rexie, it’s 3rd and 3, a toss to Leon and we get the first down and the game’s over! ), that Brady was going to march down the field and tie it. What’s funny is that after the game, Bart Scott said he knew that’s what Jets fans were thinking (hey, just because he’s new doesn’t mean he doesn’t know the pathetic history of our franchise!). But dammit the Jets D stepped up and stopped the Pats. I know, I know, the Jets are 2-0, and they’re in first place in the AFC East, but I’ve been down this road too many times before to get too excited. But you have to love how this team is playing: Aggressive, smart, tackling well (best Jets tackling team since the Parcells years) and making enough plays to win. **Something’s just not right yet with Tom Brady. Maybe rust from all the time off, or his receivers aren’t good enough, but something isn’t clicking. As you can imagine, my heart’s bleeding for the guy. ** Chad Johnson (I refuse to call him by his stupid other name), you’re a wimp for only doing the Lambeau Leap into the arms of a Bengals fan in Green Bay. But damn impressive win for the Cincy boys. **OK, you go gamble on the NFL: Houston scores seven points, all on defense, against the Jets last week. Then, against Tennessee, one of the best defenses in the league, the Texans score 34. **Couple of real good late games, Pittsburgh-Chicago and San Diego-Baltimore. The Bears, well, they downright stole that win, thanks to Jeff Reed missing a couple of field goals he normally makes. And the Chargers, well, they absolutely, positively should’ve won that game. Except their coach is Norv Turner, and once again that’s why they lost. I can’t believe he actually has one of the 32 head coaching jobs in the NFL. It defies logic. I really thought my mother could do better. At the very least, she’d make sure they had nutritious, low sodium pregame meals. **Hell of a Sunday night game. Eli Manning will never be as good as his brother. But damn, he’s getting closer. Fantastic final drive for the Giants. Clutch, clutch win over Dallas in Jerry Jones’ new castle. And can I just say how absolutely freakin’ stupid the rule is that you can call timeout a split second before the guy makes the kick? So stupid. OK, so I won’t reveal any of the Emmy Award winners Sunday night in case you haven’t watched them yet, but can I just ask: Is Neil Patrick Harris becoming the next Billy Crystal? He’s smart, he’s funny, he’s talented and can sing and dance, and he used to be Doogie Howser. He was an awesome host Sunday and I think we should just give him the job permanently. I thought it was hilarious that he introduced the presenters with their most obscure roles ever. Also, during my favorite segment of these award shows, the “In Memoriam” part (I’m weird, I know), I was shocked to hear that Mr. Bentley died. From “The Jeffersons,” remember? I loved that character. Finally, a personal horror. Woke up earlier than usual Sunday; started to do laundry. Pulled out a bunch of towels from the laundry basket and I’ll be damned if I didn’t see the largest freakin’ dead cockroach I’ve ever seen. This thing was like the Mark McGwire of insects. I screamed for the wife. She screamed. She kills cockroaches at our house, while I’m on body removal (it’s the opposite for spiders. Don’t ask, we all have our phobias). I disposed of it. Kept doing the laundry. The horrors of everyday life.